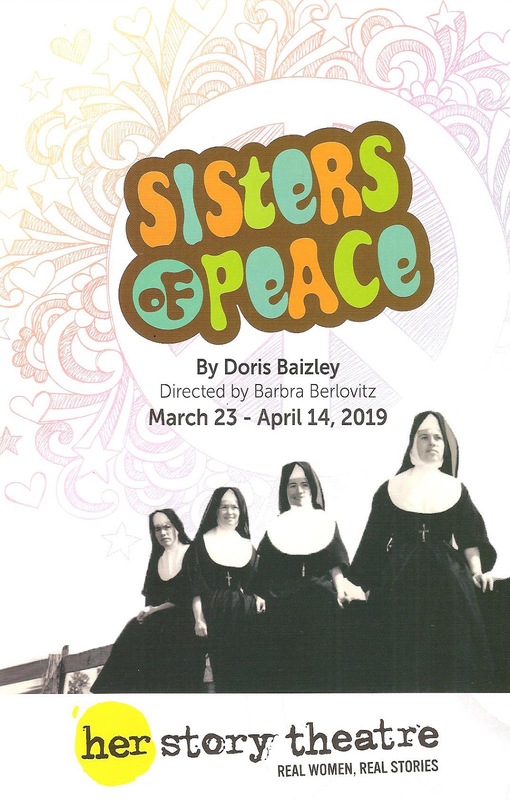 In the second of a three-show HERstory spring, the History Theatre is telling the true story of four local sisters and Sisters who actively work for peace and justice. 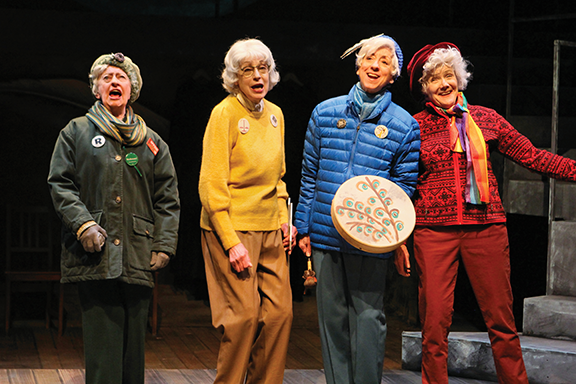 The aptly named Sisters of Peace brings these four amazing women to life on stage (who, by the way, are still alive and continuing their work in their 80s and 90s). I was so moved and inspired by these courageous and determined women who ceaselessly work to create a better world, that I was often moved to tears, amidst the laughter of their lives. These women fight not with weapons, but with kindness, music, love, and laughter. We would all be better people if we lived by the mantra, "what would the McDonald sisters do?" Sisters of Peace is not only a truly feel-good piece, but also a call to action to live more authentic lives and consider our fellow beings on this planet. 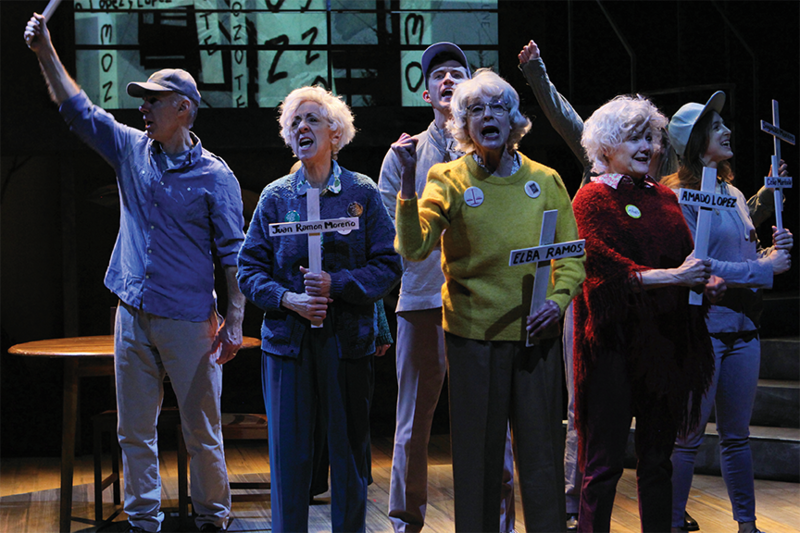 Playwright Doris Baizley leads us back and forth through the last half century or so, telling the McDonald sisters' story through pivotal scenes in their lives. Each sister has an encounter with her younger self (all impressively played by Annick Dall) that tells us a little more about her. Despite traveling the same path from large Irish family on a Minnesota farm to Catholic nun to activist, they are very different women, endearingly portrayed by #TCTheater favorites and women in their prime Katherine Ferrand, Peggy O'Connell, Sue Scott, and Wendy Lehr. The play features important moments in their lives, both out on the streets and at home with family (including their Republican legislator brother KJ). We see them in their full habits pre-Vatican II, then shedding those habits and getting out into the community. They first joined the protest movement in the late '60s, marching against the Vietnam War. They went on to protest other wars and violence throughout the 20th Century, as well as stand up for the rights of Native Americans and the LGBTQ community. Basically if there is a protest in Minnesota for peace, justice, and equality, the sisters are likely to be there. Each sister came to it in her own way and participated in her own way, but all believe fiercely in the responsibility of all of us to care for each other and the earth. For these sisters, rage against the injustices of the world is not just righteous, it's sacred. Director Barbra Berlovitz keeps the pace brisk and light, while also allowing for poignant moments. The time jumping is smoothly achieved, with help from projections of historical photos, locations, and dates. The eight-person cast works really well together; the four actors playing the sisters are each uniquely delightful, and the four ensemble members ably switch between many different characters (also including Melinda Kordich as Mom and "that communist" Dorothy Day, up-and-coming actor Ben Shaw in all of the young men roles, and Terry Hempleman, who will break your heart as Pop and then make you laugh as the pontiff). Costume designer Sonya Berlovitz dresses each sister in a signature color, with many versatile costumes for the ensemble members as they move quickly between characters. 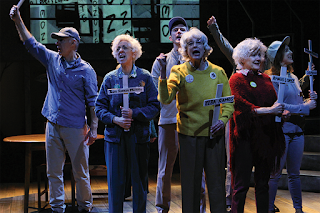 Annie Henly's simple and elegant set allows for interesting configurations, and as is often the cast at History Theatre, ample use is made of the aisles and all parts of the theater space. I've always admired nuns, growing up Catholic with several nuns in the family, and attending the College of St. Benedict. On his old show The Colbert Report, Stephen Colbert would sometimes talk about and to what he jokingly called "radical feminist nuns." But I believe that all nuns are radical feminists, whether they claim that title or not. A group of unmarried women living together without men? It doesn't get much more radically feminist than that. It wasn't that long ago that the only choices women had were to get married and have children, or to join the convent, living in community with other women, pursuing education and meaningful work (not to imply that having children isn't meaningful work, but it is not work that all women are called to do). The McDonald sisters exemplify the best that faith can be and do through their lives and their work. Unconstrained by strict religious credos or institutional hierarchies, they live their faith in their everyday words and actions, bringing to mind the Margaret Mead quote: "Never doubt that a small group of thoughtful, committed citizens can change the world; indeed, it's the only thing that ever has." Sisters of Peace continues Thursday through Sundays until April 14, with post-show discussions after Sunday matinees (click here for details).